While you won’t probably serve these cute pumpkin waffles on Thanksgiving or Christmas, you can treat your little ones to a tasty breakfast. 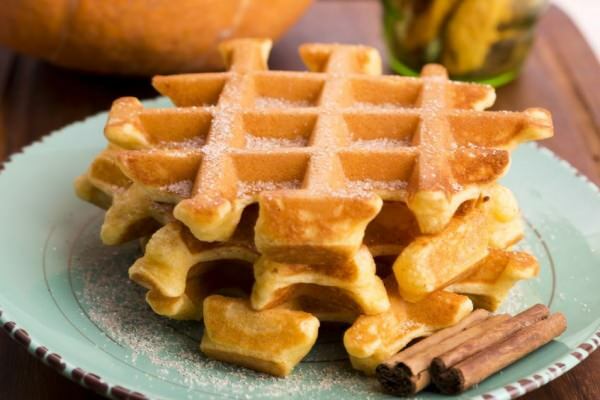 These waffles are light, fluffy and easy to cook. It takes less than 15 minutes to add the pumpkin flavor to your breakfast or Sunday brunch. In a large bowl, combine baking powder, flour, baking soda, cinnamon, pinch of salt, nutmeg, and ginger . In another bowl, mix pumpkin puree, eggs, butter, milk, and sugar. Fold in the first bowl. Mix well and let your waffle iron do the rest.